In 1994 racing legend Ayrton Senna lost his life, and as major a story as that was, it was just one part of a traumatic weekend that I experienced first hand. With the Senna Movie now on worldwide release, here is my personal diary of five terrible days of the 1994 San Marino Grand Prix, that were so far fetched, you couldn’t even have begun to script it. Imola is one of my favorite tracks on the Grand Prix championship world tour. We always stayed in a beautiful local family-owned trattoria and the food was awesome, homemade. There was no menu, you ate what you were given by the house’s Mama. And the plates always went back clean. There were no table bookings or placings, just a huge, long, wide table that sat about 20. Talk was naturally of racing, and this place probably hadn’t changed in 40-odd years. It was an event I always looked forward to. I flew to Italy with colleagues. At the airport we bumped into Roland Ratzenberger, who was in his first season of Formula 1 with the MTV Simtek team. The guys I were with knew Roland really well, and I’d covered some of his races, and was doing work at the time with MTV too. So we stopped to chat. Roland had a new prized possession, which he insisted we all should see. A brand-new blue Porsche cabriolet… He’d arrived in Formula 1, and was more than happy to show it! 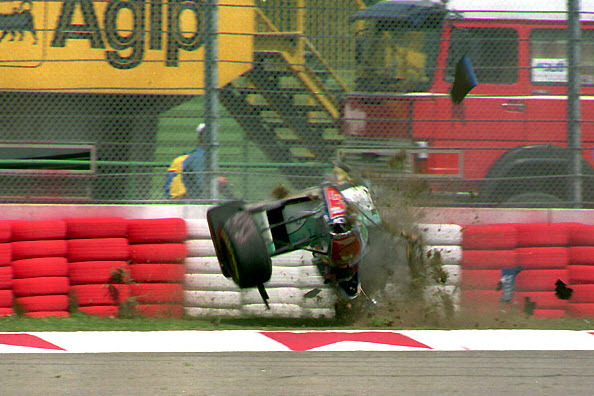 Friday was the first day of practice and, in the afternoon, Rubens Barrichello, a long-time friend (he started racing when I started writing), had an horrific crash. It stopped us all as we watched the TV monitors. It was one of those chilling moments that we hadn’t had in F1 for a long time. The car ended upside down, and it was impossible to see who it was. The marshals righted the car (badly as it turned out, and could have caused more injury, but Rubens was largely OK). He was taken to the medical centre and, thankfully, not seriously injured. Amazingly he suffered only a broken nose. That was quite a day. We retired to the Trattoria, had dinner and discussions. Little did we all know what was to come.